Accidents involving semi-trucks and other large commercial vehicles result in higher rates of severe injuries and fatalities than collisions between passenger vehicles. The Oklahoma personal injury lawyers at Carr & Carr Attorneys at Law understand the devastating effects and overwhelming costs associated with truck accidents. That’s why we’re dedicated to helping truck accident victims recover the financial security they need to cope with medical costs and other damages. If you were hurt or a loved one was killed in a crash with a tractor-trailer or other large commercial vehicle, please call us today at 888-238-4282 or contact us online. Our attorneys serve clients throughout Oklahoma via our offices in Tulsa and Oklahoma City. In addition to damage caused by initial contact, large trucks like semis also pose secondary hazards in the event of a crash. The National Highway Traffic Safety Administration (NHTSA) defines a “large truck” as any truck—excluding buses and motor homes—with a gross vehicle weight rating greater than 100,000 pounds. This includes semi-trucks (also referred to as tractor-trailers and 18-wheelers), as well as some flatbed trucks, construction vehicles, tanker trucks, garbage trucks, box trucks and other large commercial vehicles. The size and weight of these vehicles makes them especially dangerous in the event of a collision with smaller passenger vehicles. More than 4,000 people died in crashes involving large trucks in 2017, according to data from the Insurance Institute for Highway Safety (IIHS) and Highway Loss Data Institute (HLDI), and most of them were passenger vehicle occupants. Based on crash data from 2016, the NHTSA estimated that large trucks comprised more than 8 percent of all vehicles involved in fatal crashes in the United States. In addition to the damage caused by any initial contact, large trucks pose numerous secondary hazards in the event of an accident. For example, when a semi-truck jackknifes, it can create a wall that leads to additional collisions. A truck’s load may also spill, generating additional hazards for other drivers. Driver error plays a role in most motor vehicle crashes, including large truck accidents. 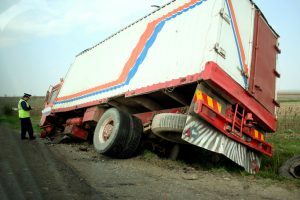 But when it comes to truck accidents, additional factors are often present, and negligence may extend beyond the driver. Faulty vehicle parts and inadequate maintenance sometimes play roles in semi-truck crashes. The Federal Motor Carrier Safety Administration (FMCSA) regulates commercial trucking in the United States, and it has established rules regarding drivers’ hours of operation, routine vehicle maintenance, and cargo loading among other safety standards. Yet some drivers and trucking companies try to bypass these guidelines in order to meet unrealistic delivery schedules and increase their profits. 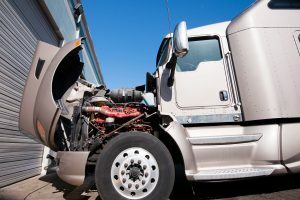 As this brief list indicates, sometimes the driver’s negligence is to blame for a crash, but in other cases the accident may be the fault of the trucking company, cargo loader or another party. Each of these parties has its own insurance providers and corresponding attorneys who may try to shift fault and limit what they pay to injury victims. This is why it’s important to gather as much evidence as you can about the crash and your injuries, and to contact an experienced truck accident lawyer as soon as possible to protect your rights. 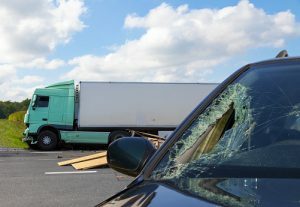 Liability in large-truck accidents may be shared by multiple parties, including the driver, trucking company, cargo loader, and others. Contact local law enforcement or call 911: Report the accident and provide law enforcement with an accurate description of what happened. Do not apologize or admit fault for the crash. Seek medical attention: Pursue immediate treatment for any obvious injuries to yourself or your passengers. Even if you don’t feel hurt, it’s a good idea to undergo a medical evaluation; not all injuries are instantly apparent. Gather information: If possible, get the names and contact details for any other involved drivers or witnesses. Take photos and/or video: If you’re able, take photos or video of the accident scene, including your injuries and resulting vehicle damage. Contact a personal injury attorney: Schedule a consultation with a lawyer who has experience handling truck accident claims. Do not discuss the crash or your injuries with other involved drivers or other drivers’ insurance providers. If a loved one was killed in a truck accident, our lawyers may be able to help surviving family members pursue compensation via a wrongful death lawsuit. The attorneys at Carr & Carr understand the complexities of large truck accident cases, and we know that initial settlement offers from truck drivers’ and trucking companies’ insurance providers are rarely enough for injury victims’ long-term needs. We offer free consultations to help you understand your options, and we don’t charge for our services unless we successfully recover compensation on your behalf. Please call us today at 888-238-4282 to schedule your free, no-obligation consultation or contact us online to tell us your story now. With offices in Tulsa, Oklahoma City and northwest Arkansas, our attorneys are ready to meet you at your home, hospital room or other location convenient to you.